It was the closest I’ve come in the last little while to ending up under the wheels of a car. As I cycled home from work in London on July 20, just by the Oval cricket ground, a car passed me far, far too close. I pulled towards the kerb and jammed on my brakes. But, amid precisely the kind of light drizzle that makes roads treacherous, the slippery surface of one of the London Mayor’s ironically-named Cycle Superhighways nearly did for me. I started to skid alarmingly, swinging side to side in close proximity to the speeding car. It’s the kind of incident I’m sometimes inclined to think may reflect my cowardice rather than the actual danger. But, as I slithered to a stop and my right pedal skinned the back of my calf, a pedestrian came up to me, looking worried. “Did he hit you?” he asked. Nasty though it was, my sliding stop at the Oval would not have been especially notable – except that it took place on my last commute for the foreseeable future in London. My route-to-work gripes are now about the stupidity of tourists on the Brooklyn Bridge, the traffic snarl of downtown Brooklyn and when precisely the large model rat that protesters have placed in one lane of W54th Street in Manhattan might disappear for good. The London mayor’s superhighways and the Metropolitan Police’s indifference towards anti-cyclist crime are fast becoming a distant memory. 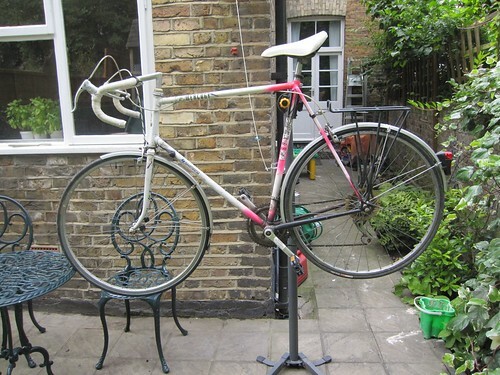 But the incident seemed as neat a bookend as any to 11 years of cycling in London – nine years during my most recent stint and two years prior before our four-and-a-half years in Hungary. As I thought about it afterwards, my mind wandered back to a dark January night in 1997 when I swung my leg over my then Raleigh Mercury bicycle and set off for my first-ever bike ride in London. I was at a car rental depot in Catford and had just returned the rented van that had brought my and the Invisible Visible Woman’s belongings down from Edinburgh. I had to find my way across the alternately grim and genteel suburbs of south-east London to my new home. To hear London’s politicians bragging about their recent achievements in encouraging cycling, one would imagine that my journey 15-odd years ago should have been nearly impossible. In fact, there were already some designated cycle routes to guide me across tracts of non-descript suburbia such as Forest Hill. The journey was about as pleasant as a ride on a cold January evening in a strange area could be. gaudy-coloured veteran of his first ride in London. The memory of cycling all that time ago nevertheless put a question in my mind. Are London and other cities enjoying fast-rising cycling numbers rising because cities are making progress, learning from their past mistakes, in their treatment of cyclists? 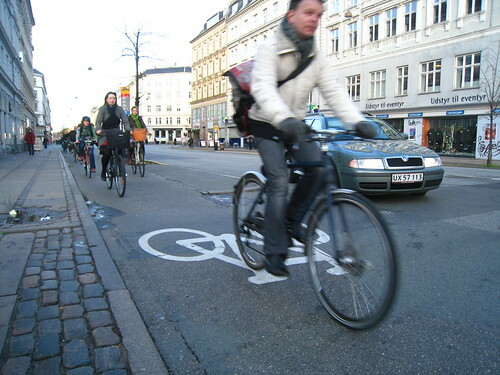 Or are cycling numbers increasing despite city authorities’ failure to understand what cyclists need? It would be silly, naturally, to claim London cycling had shown no improvement over my time. The biggest positive change has been the wholesale redesign of many urban London roads. The space at many junctions has been narrowed, to prevent cars swinging round them at high speed. Many streets have been made to look narrower, a step that has brought motorists’ speed down. Parking spaces in many places are now more clearly marked as an area off to the side of the main carriageway. I used, when I first cycled in London, inwardly to ask drivers who’d prevented my swinging round a parked car, “How did you think I’d get round it? Fly?” It’s a line that popped into my head far less often later in my time in London than in the late 1990s. That it’s coming back to me again regularly in New York illustrates how big a lesson the Big Apple’s traffic planners have to learn from London in this area. 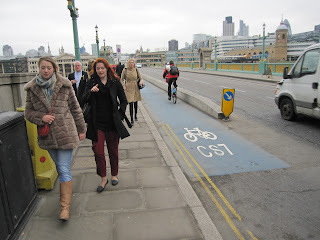 Cycle Superhighway 7 at Southwark Bridge. There has been some modest improvement in the quality of cyclist-specific infrastructure in London too. The number of bike parking places has increased sharply – albeit not as fast in many areas as the demand to park bicycles. The number of markings telling motorists to leave space for cyclists at junctions has increased. The cycle superhighways have appeared along a number of main roads, although my experience in July illustrates the problems with putting routes with slippery surfaces along busy main roads where nothing is done to prevent cars driving poorly. But the curious point that my July 20 experience illustrates is not how much has changed since 1997 but how much remains the same, despite 15 years when every senior politician associated with London has expressed devotion to improving the cyclist’s lot. I’d seen the motorist that buzzed me behind me at traffic lights and, seeing that he was driving a black, souped-up saloon car, guessed that he was likely to overtake me dangerously. Sure enough, instead of waiting for a safe place and space, he barged through as if, essentially, I weren’t there. Looking at it from the motorist’s point of view, perhaps that isn’t surprising. The British Highway Code certainly tells motorists they should give cyclists as much passing space as another car. But who’s reminding motorists of that point? Aside from a half-hearted Transport for London campaign a few years ago urging motorists and cyclists to “share the road,” there’s been almost no effort to educate motorists over ten years when cyclist numbers have doubled. Yet almost none of the politicians or officials I’ve heard talking about encouraging cycling has seemed to have cyclists and cycling as their focus. Cycling was meant to cut road congestion, or reduce pollution or increase people’s physical activity rates. With some politicians, it’s tempting to conclude that they want mass cycling almost as a sign of their city’s coolness – look, our people cycle just like people in Amsterdam! Look, you could barely tell us apart from Copenhagen! A few years ago, there was a similar craze in Europe for planning light rail systems. Bikes seem, in more straitened times, to have taken over. The result is that the people who make decisions in big cities seem ill-prepared for cycling’s messy reality. Since 1997, tens of thousands more Londoners have started pedalling into central London every morning. Most of them are in a hurry; many are no more considerate of their fellow road users than the motorists alongside them and all of them take up at least some space on the roads. The picture of cycling in many politicians’ heads seems to be drawn from the architectural drawings they show off when boasting about a planned riverside park or other “green” amenity. The cyclists in those never look like they’re in a hurry or like they’re shouting at some idiot that’s stepped into the cycle lane without looking. Many policymakers – and plenty of motorists – seem affronted when cyclists diverge from this unrealistic ideal. Nobody wants to spell out to motorists that, in a given road space, more cyclists means less space for cars. We’re meant to take as little effort to pass as the paper-thin, pencil-drawn cyclists in the politicians’ drawings. People are happy if their neighbours free up a parking space by taking up cycling – and furious if they ever get in their way on the road. It’s certainly not a London-only problem. Ten days after my permanent move to New York, I was bowling fast down a marked cycle lane in Brooklyn, reflecting that the lane was far too close to the parked cars. A car door suddenly opened, I jammed on my brakes and, just as I had in London, lost traction and skidded – once again fairly safely – to a halt. 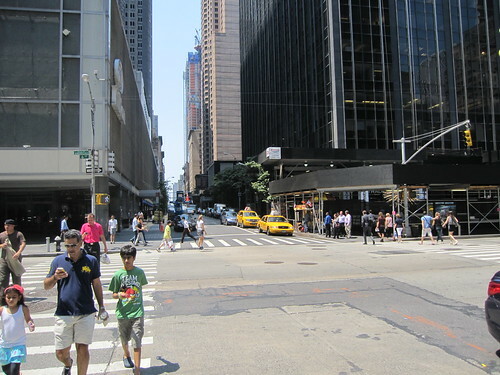 New York cycle lanes’ placing reflects the same, apparently widespread delusions as policy in London – that cyclists should take up no space, have no momentum and always be ready to give way to pretty much any other road user. It’s not inevitable, however, that every politician will always prefer to let motorists set the agenda. The change that has done most since 1997 in London to boost cycling numbers was introduction in 2003 of a charge for driving into central London during weekday peak hours. The decision, by making clear the costs of road use, instantly removed large numbers of vehicles from central London's roads. Cyclists took up some of the freed space. Advisers to Ken Livingstone, London’s then mayor, advised strongly against introduction of the congestion charge, on the grounds that no battle with London’s motorists could ever be won. In recent mayoral elections, while candidates have proposed modifications, no serious candidate has suggested ending the charge altogether. It’s hard to foresee the circumstances that would prompt a future London leader – or a mayor of New York or any other similar world city – to take firm action finally to prioritise bicycles properly over cars. Until it happens, there may be further, incremental rises in cyclist numbers of the kind London has experienced since 2003. But proper progress will require real boldness. Let us hope NYC proves an improvement. If not, you'll just have to take Texas and I'll show it to you - well, hopefully not the lady from,last week, but most of the rest. Thank you for your comment. Having read your last post (http://dfwptp.blogspot.com/2012/09/stepping-down-pyramid-with-mirrors.html) I definitely don't like the sound of that woman you mentioned. But you never know - I might make it down to Texas with my bike some time. I'll just hope I don't encounter the same person. "...in a given road space, more cyclists means less space for cars". Not really, because more cyclists will (mostly) mean fewer cars. In particular in places like London or Stockholm, where congestion charges have been implemented. Thank you for your comment, Anonymous. It was a carefully thought-out point, however. I seem to remember - though I can't quote chapter-and-verse - that there has been research on which modes of transport commuter cyclists use before they start cycling. There are almost no car-to-cycling moves. The cyclists were generally on public transport before. People started cycling more in London following the Congestion Charge because the roads were less threatening so they switched from the (crowded) buses and underground. A lot of the reduction in cars, meanwhile, resulted from the diversion of journeys that would have gone across Central London to take other routes. I like this: "many are no more considerate of their fellow road users than the motorists alongside them" because there's a recognition that just pedalling a bike doesn't make you a saint. What's your view on training? I travel to work in Cambridge, the majority of the cyclists here seem content to put their safety wholly in my hands - for example, pulling out when it's my right of way, cycling across pedestrian crossings when I've got a green light - and I do find it very stressful. I'd much prefer their, and my , safety, to be a shared responsibility but that requires training and education on both sides. Thank you for your comment. I'm always happy when a motorist comments on here - it's a sign I'm reaching out beyond the cycling ghetto. There's no group of road users that couldn't do with improving its behaviour. 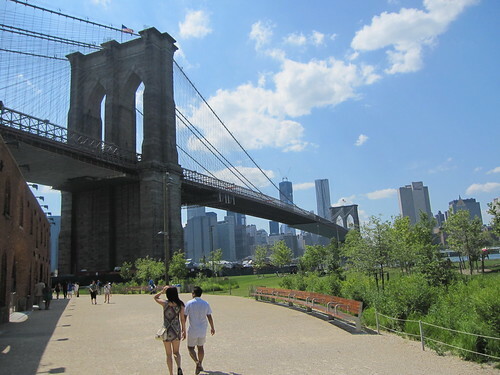 Every day in New York, I battle with runners and other pedestrians on the bike-and-skater only Hudson River Greenway, when there's a perfectly good - in fact, very nice - separate walkway for them. I wish they would be more considerate of my problems and the stress they're causing me. But the fact remains that it is my sole responsibility to do my best to avoid hitting them, however much I disapprove of their behaviour. That applies even more on the rare occasions when I drive a car (I'm driving today, as it happens, in Detroit). I can easily kill someone else with a car, while it takes some effort with a bike. And, given that the idiots I see behaving atrociously in cars have all either passed a driving test or evaded police efforts to catch people driving without licences, I'm mildly sceptical of the value of any kind of compulsory training for cyclists. That said, some people find training very useful and it has to be a good thing for all kinds of road users to learn to think more carefully about how they behave. And, in (central) london in particular, there are some cyclists (usually couriers, but not always) who should NOT be allowed out. The 2-wheel equivalent of the Golf-driver I saw a couple of years back who ran a well-red-light, whilst on his mobile phone, in other words. E.G. The lycra-isiot who ran a woman down outside Cannon St station, and managed to escape, in spite of someone trying to stop him. Yes, you get them in ALL areas, don't you? "The lycra idiot who ran a woman down outside Cannon St stn". Mmm. Could it be that she was crossing the road without looking, or had not anticipated that the cyclist may have been travelling a good deal faster than she had anticipated? Pedestrians should not cross roads except at designated crossings or when it is certain that the road is clear. Just wondering if you have considered a different style of braking so as to avoid skidding out wildly when you need to make an emergency stop. The late Sheldon Brown espouses the opinion that using primarily the front brake will allow you to stop much sooner than using the rear which will always lock up and slide. Best of luck in NYC, stay safe. Thank you for your concern. How best to brake is a tricky issue and I have thought about it. I don't think I quite have the guts to stop primarily with the front brake, however. I think it would take too much of a change from decades of using primarily my rear brake - and I think that, in the incident I describe at the end of the piece, which took place going down a bit of a hill, it could quite easily have pitched me over the handlebars. I don't actually skid very much at all - these were rare and isolated incidents. I think pretty much any rapid stop on one of the Superhighway surfaces would result in a skid - they're very, very slippery. But I should probably review my technique in this area. Just because my dad told me 30 years ago to use my rear brake doesn't mean I need to keep doing it now. IM. I totally agree with the previous comment. You really need to re-train yourself to use the front brake as the primary means of stopping. It is far more effective than the rear and is recommended on the majority of cycle sites (just google "front brake cycle" if you don't believe me). The key to not pitching yourself over the front handlebars is to ensure that your weight is back over the rear wheel rather than hunched over the handlebars. Actually, that is one of the things students practice in Bike Ed - proper panic stops.